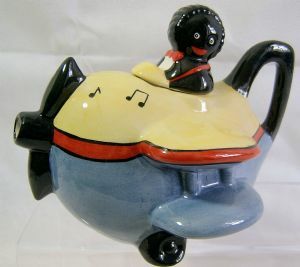 This Teapot is one in a limited edition series of Novelty Teapots to feature, in this case, the ever popular Golly as the Pilot. This series of Pots has been manufactured for Artware Collectables exclusively and is based on the original 'Red Baron' style Teapot using the rather basic bi-plane aircraft, each different Pot featuring a novelty pilot. In the series are Elvis, Churchill, a Bulldog, a Golly and a selection of WWI pilots in a variety of alternative colour schemes such as the Union Flag, Lucy May, Blue Max and others. There are only 100 pieces available and each one comes with a Certificate of Authenticity. It is very much worth mentioning that all these posts are freehand painted, there is no transfer colouring on them at all. Each Pot measures 7.5 inches (19 cms) in length with a height of 6 inches (15 cms). It is backstamped in gold and numbered appropriately.